16T10-1350 SynchroLink Metric Timing Belt (Polyurethane). Bando USA 16-T10-1350. Lightweight, quiet, clean, and maximum heat, oil, and ozone resistance. Perfect for aluminum or plastic pulleys. Best for industrial textile and office machine use. 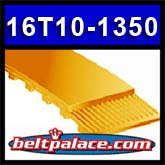 Replaces OPTIBELT STF 16T10/1350 (Polyurethane).